What Green Roof Incentives and Policies are International Cities Using? The previous part of the SERIOUS ABOUT GREEN ROOFS series focused on tying together the basic arguments around green roofs and their policies and incentives. Now that you know what it all means we can move on to the interesting part! In order to conduct my research I did extensive literature, document and policy reviews on the chosen case studies. Once this was done I had a chat with a green roof specialist in each area to fill in the blanks. 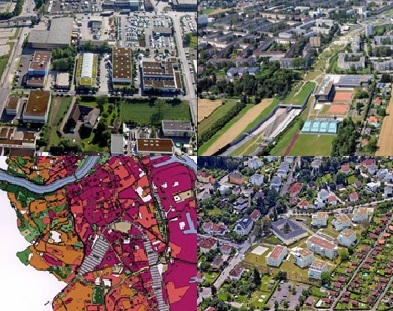 The end result was a unique perspective on how the green roof industry in each one of these cities developed. Let's have a look at the international case studies before moving towards a more local context. The Impact of intense Industrialisation during the 1960s and 1970s in Linz left the city with little quality green space. Once this became a genuine problem the urban planners started to put together a Green Space Plan approved in 1984. This plan utilised technology policies to enforce the use of green roofs on industrial, commercial and underground parking facilities. Up until today it is required for any such building larger than 500m2 or with a roof at a slope of 20? or less to utilise a green roof. As you can imagine, when these policies came into play the developers were not happy. Therefore, to avoid a crisis situation, the City started to hand out direct financial incentives in the form of subsidies in 1989 covering 30% of the construction cost of any green roof constructed. These subsidies steadily decreased as the green roof industry stabilised and developers started to accept the necessity of green roofs. 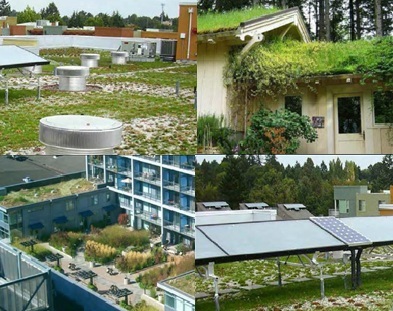 Portland's green roofs, or "eco roofs" as they call it, started in 1996 in a desperate attempt to find an innovative solution for their stormwater problems. Various research projects during this time eventually lead to the Green Building Policy in 2000. This technology policy entailed that all City owned facilities' roofs had to have a green roof covering at least 70% of the roof area. In 2005 the City's Stormwater Manual started to require developments exceeding 500ft2 of impermeable surfaces to use onsite stormwater management technologies of which green roofs where identified as one such technology. It was only in 2008 that the City started their "Grey to Green" grant programme which used direct financial incentives to encourage technologies such as green roofs for their various city wide benefits. The grants were limited in number with only selected projects receiving $5/ft2 of green roof constructed. Other methods included the Central City Plan District's bonus floor area as well as the Clean Rivers Rewards Program. Both of these are seen as indirect financial incentives as citizens are offered the opportunity to indirectly gain money back through either an increase in their allowed density or a credit on their stormwater bills if they constructed a green roof. BREEAM is a sustainability rating tool used across the United Kingdom. Vegetative roofs may be used to obtain marks in relation to increased ecology as well as improved surface water run-off. Garden roofs have been used in London since 1998 when an intensive garden roof was constructed on top of a high-rise building to be utilised by a restaurant. Only in 2008 did the first green roofs appear on retrofitted buildings. During this year the first Living Roofs and Walls Technical Report was published to showcase the benefits for and barriers against green roofs specific to London. This report assisted in the formulation of the first green roof technology policy. The concept of "living roofs" was included in a few sections of the London Plan: Spatial Development Strategy for the Greater London. All major developments are expected to utilise green roofs as a climate change mitigation technique. In support the Sustainable Design and Construction SPG is used to describe the technical implementation of the infrastructure. 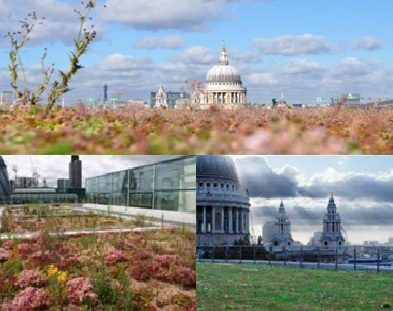 Recent programmes, such Drain London, have shown an interest in providing direct financial incentives to proposals utilising green roofs for stormwater mitigation. There are no policies or incentives within the area to encourage green roof implementation. However, there are a few encouraging and noteworthy projects run by the local university and interested private sector businesses. The only formal incentive is a sustainable rating tool called LEED that has been in effect since 2000. 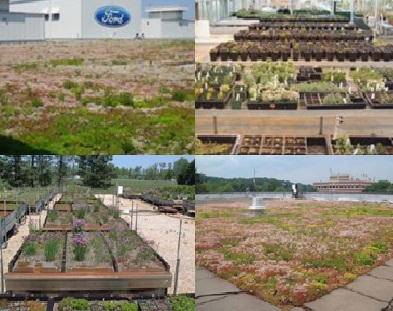 During the same year the Ford Motor Company approached the Michigan State University for assistance on a green roof they wanted to implement on their new Dearborn truck plant. The result was one of the world's largest green roofs to date at 42 117m2. Since this project the University has launched various other independent research projects on the university buildings and grounds. Continued studies have established professionals in this field within the area. One such firm has created their own green roof implementation model and has recently opened up an office in Cape Town. Research: Linz spent twenty four years researching before deciding what to do and how to do it. If this were to be taken as a benchmark Lensing will only start its implementation in about 10 years. Obtaining information such as green roof construction and maintenance in a local context is essential. Motive: Various aspects influenced the eventual implementation of green roofs within these examples. However within the three more established cases at least one main motive can be identified. For instance Linz implemented green roofs as a way to combat their lack of sufficient green space after the industrial era whereas Portland utilised green roofs as a technology to mitigate stormwater. London's policies are more focused on all of the benefits of green roofs indicating that they were more interested in climate change mitigation. Support: The influence of supporting authorities on the urban transition is immense. Linz, Portland and London have the full support of the City which has enabled them to pursue their desired outcomes. In addition, the Lensing example has also shown that the support from a University could also be beneficial in this regard. Variety: Linz, Portland and London all have more than one policy or incentive to encourage green roof implementation. This does not necessarily mean that a higher variety will ensure a greater number of green roofs. However, it offers more opportunities for the implementation thereof by various stakeholders. Main Source: Booysen, K. 2013. Aspects that encourage the successful integration of Green Roofs in cities: Policy Issues and Green Roof Specialist Perceptions, Dissertation submitted in partial fulfilment of the requirements of the Degree in Master of Philosophy in Urban Infrastructure Management and Design, Department of Engineering and Built Environment, University of Cape Town.